The worst possible opponent at the worst possible time. That’s what I kept thinking when I watched Gerald Melzer play yesterday in his first round match at the Men’s Clay Court Championships against Paolo Lorenzi. I got to Court 3 just in time to catch the entire match; I wanted to witness just the second time in the career of Jürgen Melzer’s younger brother that he was playing the first round of an ATP event (the other time that happened was almost 3 years ago in Umag). Starting on Saturday, Gerald had battled through three qualifying rounds, beating Alex Kuznetsov easily in the first round, surviving a match point in the second against Roman Borvanov, and then getting a nice win over former tournament champion Ivo Karlovic to clinch his main draw spot. All of these matches were played in pretty tough conditions: under unkind sun and violent gusts of wind. 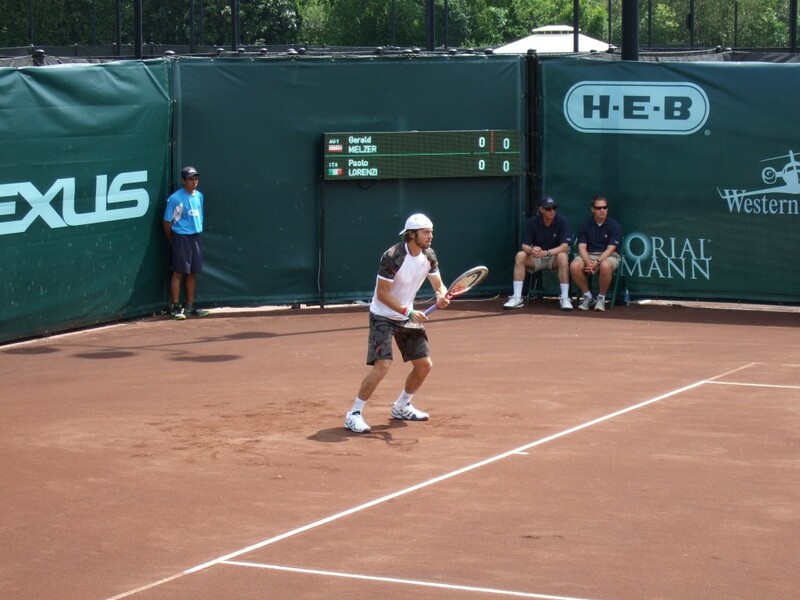 Melzer had caught the attention of a few fans during the weekend – particularly after his win over Ivo Karlovic in the last round of qualifying. On my way to the country club I met a nice man called Bruce who had watched that particular match, and wanted to catch Gerald Melzer again. Bruce liked Gerald’s game, and I agreed – when the younger Melzer is clicking, he’s fun to watch. At any rate, I sat down to watch Melzer, who had a promising start. He had a break point on Lorenzi’s serve early on, but couldn’t take advantage of it. In the next game, he got broken, and would lose six straight games: from being tied at 2-all in the first set he went to being down 2-6 and 0-2. The Italian veteran was giving nothing away to Gerald: I’m not sure Lorenzi would have totaled more than 10 unforced errors for the entire match. Gerald’s forehand started flying on him. His trusty backhand, which had been such a rock during the weekend, abandoned him, too. The switch from having plenty of open space to hit the ball into during the Karlovic match to having to construct points and find ways to outmaneuver a very consistent clay court specialist was too much for the 22-year old. 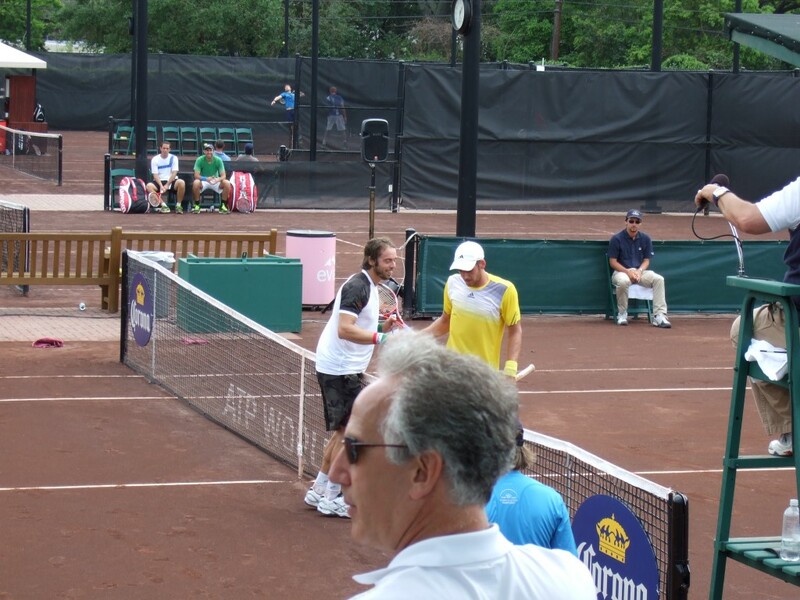 The match was over in a hurry, 6-2, 6-2. Gerald then mentioned that he had struggled with a stomach bacterial infection while in South America earlier in the year. For some reason, I didn’t check his playing activity before I talked to him. Now I’m glad I didn’t: poor Gerald had to retire in the first round of his match at the Salinas Challenger event. Of course, taking a serve early is a pretty unique skill, and plenty of people like to drop back and take their chances with a high ball. Gerald thought the River Oaks clay is not that fast, but that the bounce wasn’t a problem. He said that when it’s cold and wet in Europe clay tends to behave that way, too. Gerald did say that in his opinion it’s easier to slide on a surface like this. After Houston, Gerald will probably head to Panamá to play a Challenger, because it might be easier to get in that draw than in Sarasota. After that he’ll play the Savannah and Tallahassee Challengers. If things don’t go well there, he’ll stay for two more Futures in Florida. Gerald Melzer, as I mentioned above, is just 22. He’ll keep playing Challengers and Futures, but I think that if he can summon the form of the first three rounds of qualies here in Houston, he’ll surely get into more ATP main draws in the near future. And maybe, just maybe, Gerald can get that coveted first official win on the ATP World Tour one day.